I was overwhelmed watching this because I could not believe Disney really pulled it off. The studio was well aware of the fire they were playing with when they decided to make a sequel to the iconic Mary Poppins. Unlike the safer live-action remakes of animated films they’ve been doing lately, this film recreates something so idiosyncratic and unique that the project could’ve gone wrong in so many ways. Thankfully, it’s in both spirit and in song a near impeccable followup to the original, even to the point of hiring a non-English actor to play a chimney sweep as a sidekick to Mary. This film is a time capsule of ’60s family musicals that nobody makes anymore. No scene is more indicative of than this than a spellbinding sequence when Mary & Co. attend an animal carnival by jumping into a painted vase. There are things shown there that I don’t think have been seen or done in a movie in at least 25 years. It’s not just the novelty of seeing classic 2D animation blend in with live action performers–in lesser hands that could’ve just been an easy gimmick–but that by its incredible imaginative power it makes you feel as if everything in life is going to be okay. For a music and dance number to be that life affirming goes to show how much love went into creating all of this. This feeling doesn’t abate. With every subsequent musical number you get this wonderful feeling of reassurance and hope culminating in an enrapturing scene during the finale that takes place high above in the sky. I adored every wonderful, whimsical, pure-hearted musical number this movie had. As with the music, the casting is also noteworthy. The new child actors are perfectly cast, especially Pixie Davies, the young girl who plays Anabel. She’s got an incredibly effervescent talent that will most certainly result in acting nominations or awards in her future. Normally child actors can be so precocious as to only exist within the realm of movies, but she plays her role with such conviction she comes across as a sincerely intelligent child. I haven’t been that impressed with child actors since the early Harry Potter movies. They may just be supporting characters but they play their roles well enough as to make you believe in how much they believe. Furthermore there aren’t a lot of quality movies made for children today that appeal to kids under 10 years old. I highly suggest if one has children to go and take them so see this. It’s so wholesome and pure and imaginative and life-affirming, there’s no doubt it will win them over–just like the original did for all of us who grew up with it when we were kids. 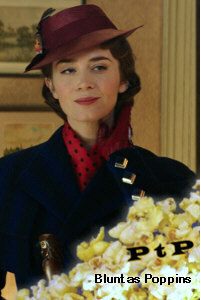 Mary Poppins Returns is playing now at the AMC Southcenter 16, the AMC Kent Station 14, the Century Federal Way, and Regal’s Stadium Landing 14 in Renton.